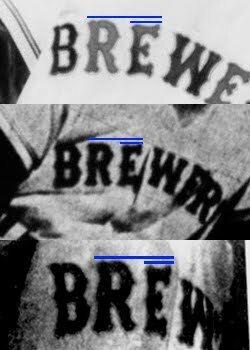 While we all know that the current major league Brewers club took its name and first logo from the much-loved Brews of 1902-1952, the Brew Crew's uniforms have never referenced the Brews beyond a throwback game or two. 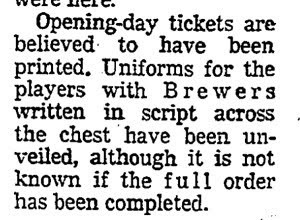 That might not have been by choice - the origin of the Brewers' uniforms is a complicated one. 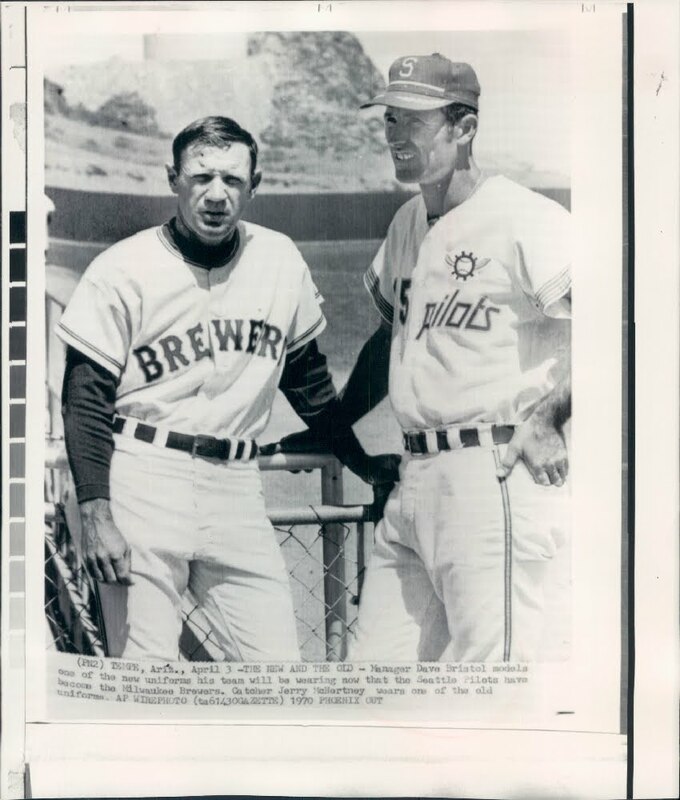 It's common knowledge that the Milwaukee Brewers baseball club, purchased out of bankruptcy by Bud Selig's group six days before Opening Day in 1970, was a quickly-assembled outfit. 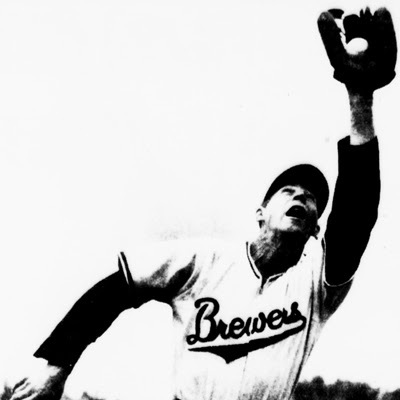 Although Selig's organization (bearing the "Brewers" name) had been in business since the Braves left in 1965, founded specifically to bring a Major League club back to the Cream City, the Brewers needed to create out of almost nothing the vast local infrastructure that couldn't be moved with the club's equipment from Seattle. When it came to uniforms, they ended up keeping their Seattle Pilots togs, swapping out the city and team name (but retaining the Pilots' distinctive sleeve striping). 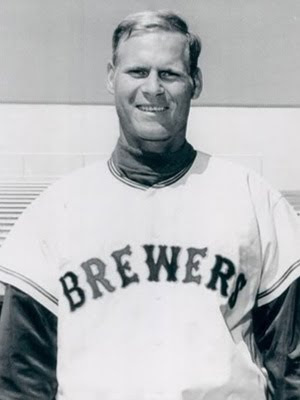 What is not as well known is that Bud Selig originally had something very different in mind, and the uniforms Milwaukeeans saw running the County Stadium bases represented a fallback plan for the Brewers. These weren't even Bud's second choice for his club - the 1970 uniforms, now a fixture of Turn Back the Clock days, were at least the third versions designed for the young club before they ever took the field. 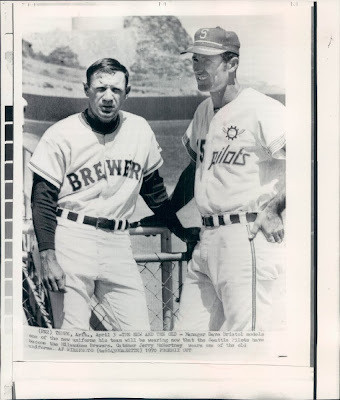 TEMPE, ARIZ.–Marty Pattin, who won seven games for the Seattle Pilots in 1969, breaks out a Milwaukee Brewer uniform at the Pilot-Brewers training camp here 4/1, a day after the Pilots became the Brewers. Instead of the vertically arched block letters, we are treated to a radially arched name written in a version of the MLB Tuscan font, which to this day is used by the Red Sox and Mets (and at the time was also found on the jerseys of the California Angels). We can't tell for sure from this photograph, but it's certainly plausible from the contrast on the piping that they intended to keep the royal blue/athletic gold color combination. 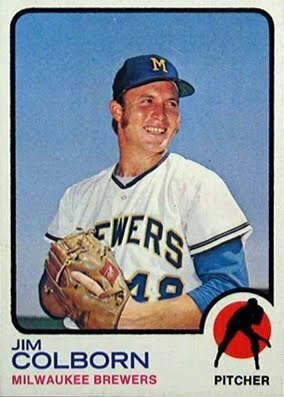 Selig had reportedly favored a navy and red scheme, the same as the Brewers he grew up watching at Borchert Field. Early promotional materials for his club, before the Pilots opportunity presented itself, featured those colors. In any case, the tight timeline before Opening Day left him little choice but to keep the colors, which (in a darkened form) continue to define the True Blue Brew Crew to this day. 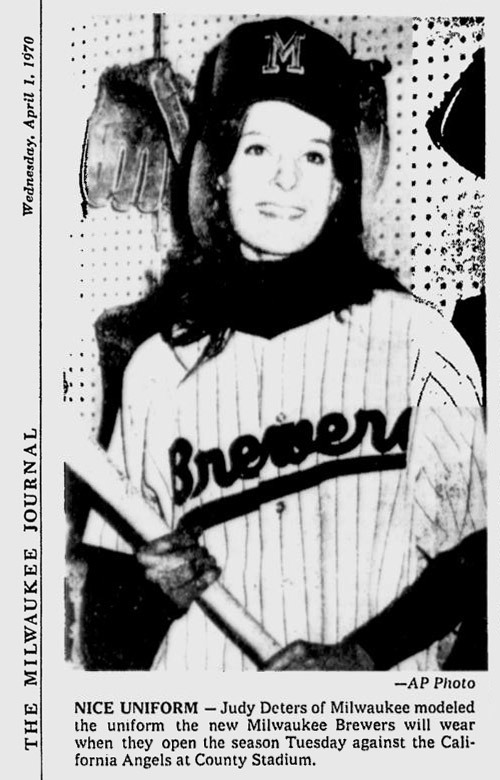 When the newly-minted Brewers' plane touched down at Mitchell Field in Milwaukee, it was met by 8,000 fans ready to welcome their new heroes. The concourse was so packed that the planned ceremony was hastily pared down. The local dignitaries who had prepared "a few remarks" had to content themselves with shouting in the general direction of the assembled battery of radio and telephone microphones. The fans stood in the concourse, cheering and waving homemade signs reading "We love you Brewers", "Brewers are Boss", and referring to the sad-sack club turned World Champions, "If the Mets Can Do It, So Can We!" 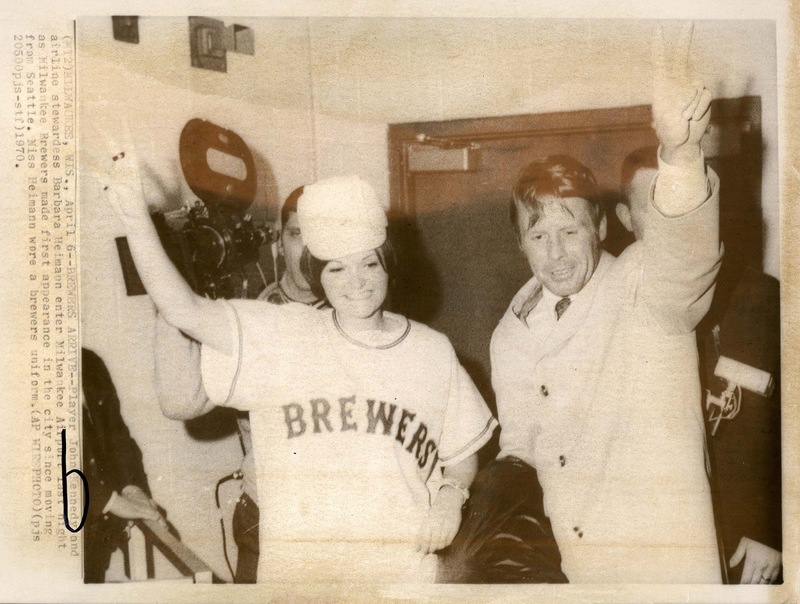 One held aloft a steel beer keg and a cardboard sign reading "Brew for the Brewers!" The Brewers, for their part, joined in the fun. 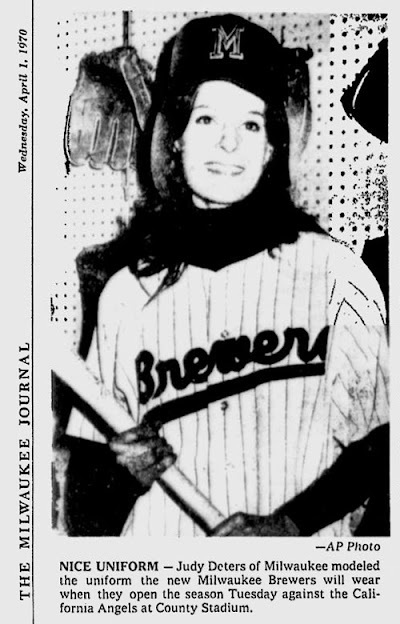 The Milwaukee Journal reported that manager Bristol was excorted down the ramp on the arm of a stewardess "wearing a Brewer shirt over her miniskirted attire." She gave a victory sign to the crowd after they reached the terminal. Keep in mind that the Brewers landed at Mitchell Field shortly after 10:00 pm on April 5th, less than 48 hours before their first game. That close to opening, and the Tuscan jersey was still on proud display. 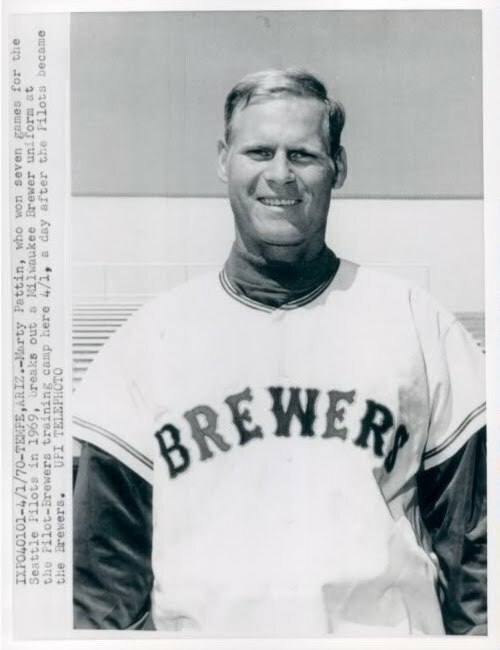 It appears that Barbara Heimann, the flight attendant in question, may have been wearing the same jersey Dave Bristol was photographed wearing three days earlier, raising speculation that there was only a single prototype of the Tuscan style produced for the Brewers. At first glance, it appears as though the top letters are thinner, but I believe that is from the gold outline being washed out by the lights. In the other two photos, scanned from microfiche, the gold outline flattens against the blue and makes the letters appear thicker. The positioning of the letters might be more instructive. Looking at the "R" and "E", they appear to be roughly the same in all three views (the "B" and "R" are much closer in the Heimann photo, but that could be caused by her wearing a jersey obviously several sizes too large). They are on a similar angle, with the "E" being slightly lower on the plane. If I am correct about the gold outlines, that would account for the differences in spacing gap between the letters. Maybe someone with more photomatching experience can help out, but it certainly seems plausible that only one prototype was created. So that was one plan for last-minute Brewers jerseys. Tuscan lettering, thin blue/gold/blue stripes at the neck and cuffs (the striping would be implemented the following season). Contemporary newspaper accounts, such as this AP article about the impending Pilots sale written by Charlie Barough (and carried by the GettysburgTimes on April 1st), tell of another. Pinstriped uniforms? 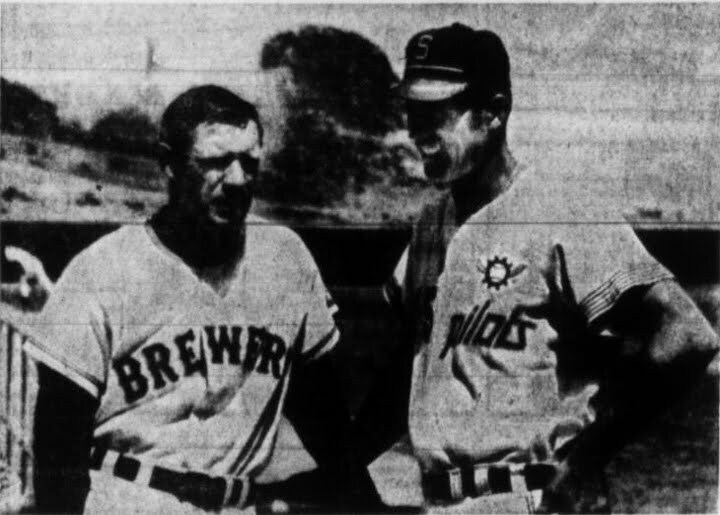 Although now synonymous with the Crew's glory days, the Brewers wouldn't add them until 1978. Was that Bud's original plan for his Brew Crew? 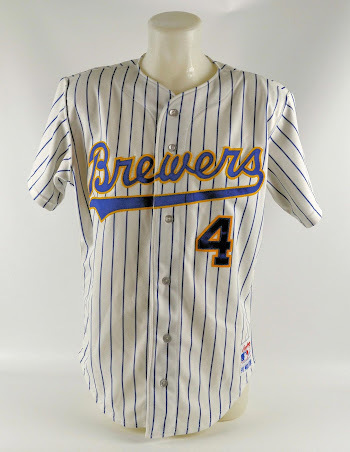 So now we know the original plan was for pinstriped uniforms with a script "Brewers" wordmark across the chest. I haven't been able to locate any other contemporary accounts of the uniform "unveiling" but will continue to look. 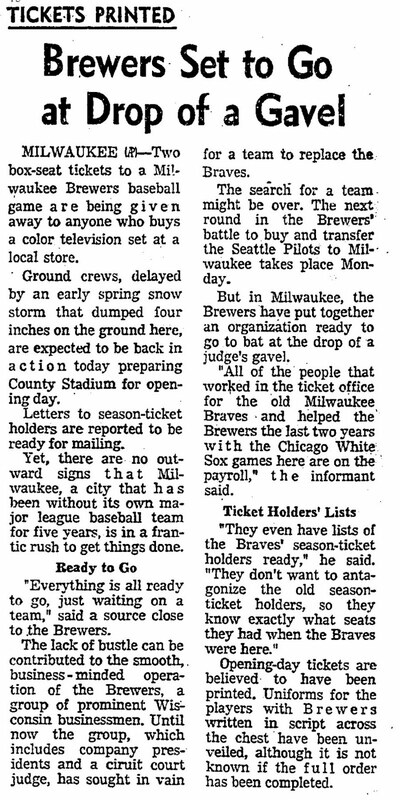 Another intriguing possibility is raised in this March 17 article in the Wall Street Journal describing Milwaukee's preparations for the Pilots (obviously a very popular subject). It would take a "week or two" to outfit the club in new uniforms? I presume that refers to the pinstripe/script jerseys. No wonder they just modified the ones they brought from Seattle, but we don't know why they didn't alter them with Bristol's Tuscan lettering. 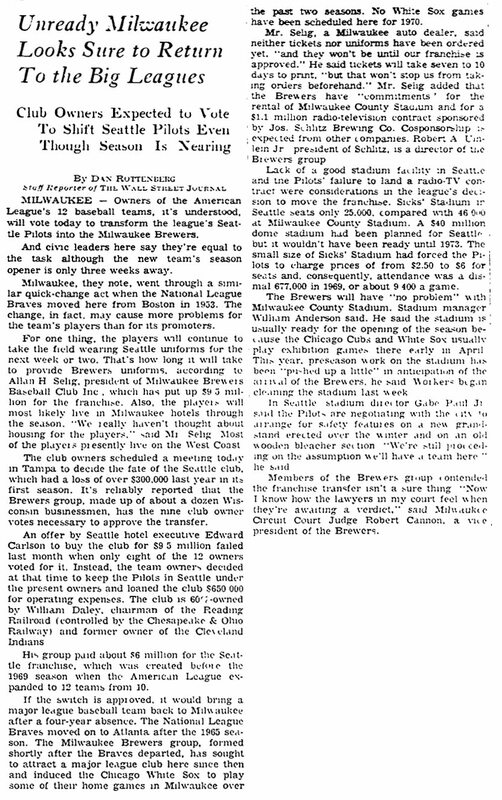 It's important to remember the general level of chaos which must have swamped the Brewer offices at the time, with only days to arrange everything a ball club needs, from printing tickets, schedules and programs to hiring vendors, ushers and ball boys, to finding a places for the players and their families to stay until they get settled in the Cream City. Uniforms couldn't have seen very important at the time, especially when there was a handy (if temporary) solution available. 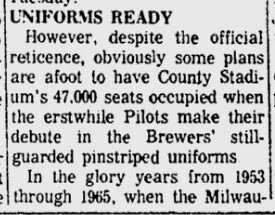 Fortunately, Selig & Co. were able to alter the existing Pilots uniforms, and County Stadium fans were spared the indignity of singing "root, root, root for the Pilots" during the Seventh Inning Stretch. Pinstripes, check. Inspired by the jersey "hanging in a downtown sporting goods supply store"? Perhaps, or perhaps the artist just thought pinstripes were an icon of baseball. 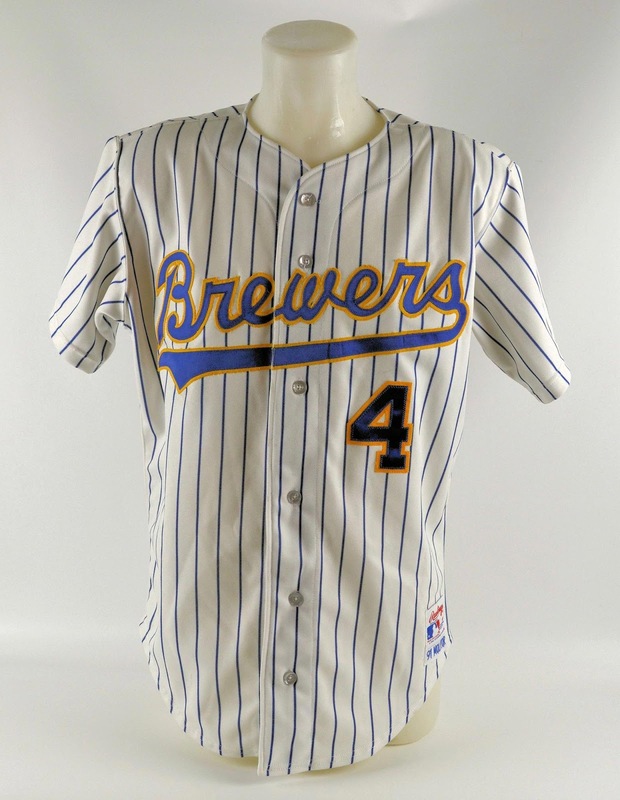 The mention of a script "Brewers" mark on that publicly-displayed jersey is also interesting. Just to bring this back to the Brews, could Bud have been planning a return to the elegant script introduced by Bill Veeck to the club in 1942? We will never know what might have been. 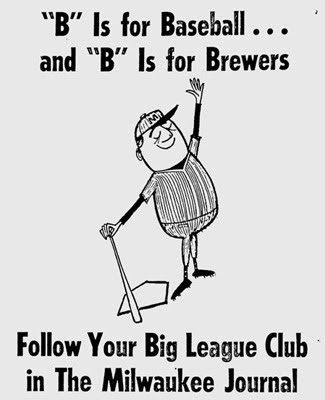 The then-American League Brewers might have picked up more than a name from their American Association predecessors. Check out the links to read the rest of the story. I still believe there was a photo - I remember seeing it in the defunct "The Paper" in Oshkosh right after the move - of pinstripes with a script, although it's a little thicker - remember, this is all from memory of 1970 - than the last picture above. I'd still love to find it. Thanks for the nod. Ray B.
I recall seeing this jersey at College Athletic sporting goods store in downtown Milwaukee on Plankinton Ave. I think the jersey was white with navy pinstripes and Brewers in navy and red script. It's my understanding that Bud Selig's original plan was blue and red, like the old Brewers, if he had been able to design a uniform from scratch. Glad to get some confirmation - thanks!